Bishop Brian Seaver first connected with Easton Mountain when he attended an Advent retreat, December 2-4, 2005. He returned on Christmas eve to say mass. Brian is a bishop of the Old Catholic Church - which is not the Roman Catholic Church, but a denomination that split from Rome in 1724 over the issue of papal authority. That's a brief encapsulation of a church history that includes a lot more that happened both before and after the separation. If you're interested check out the Wikipedia article, "Old Catholic Church." Brian had been ordained the previous August, so the mass in our temple was his first Christmas mass. Subsequently, there were conversations between him and John Stasio that led to John first receiving minor orders in a ceremony in Brian's home attended by Dave Sledesky and Sunfire. John was then ordained a priest in 2010, as mentioned in a previous post: "The Icon Cross." 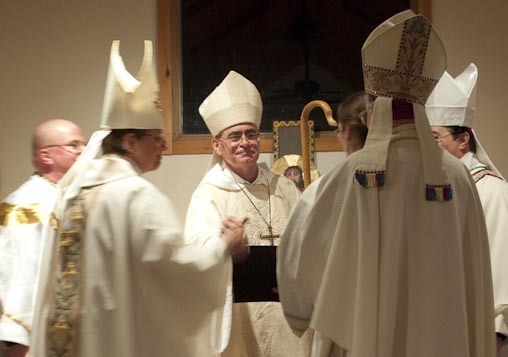 and much of Michael's work in helping gay men who want to preserve a connection to Catholic spirituality has been done at Easton Mountain and within Easton Mountain's extended community. 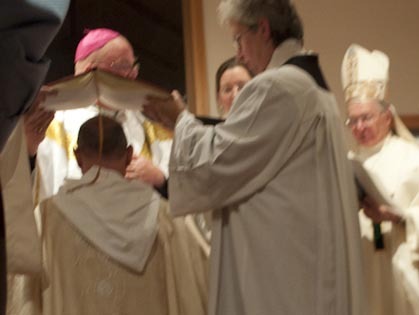 The photos accompanying this posting are from the 2010 consecration.